1. True or False: Corn hybrids with high test weights also yield more per acre. False. The relationship between yield and test weight is not reliable; high yielding corn can also have a tendency for low test weights. 2. How many pounds are there in a metric tonne? There are 2,204.6 pounds in a metric tonne. 3. True or False: Test weight is not affected by the moisture content of the corn. False. Test weight is affected by moisture content, but the adjustment is not always clear. 4. There are at least two distinct bushel types for use in grading corn; the Avery bushel and the Winchester bushel. Which is bigger? The Avery bushel is bigger (this is the one referenced most often). Table 1. Minimum test weight requirements for corn grading in Canada. 2009 has had growing conditions that have generally not been favourable to grain filling and test weights are sure to be a concern. Some facts may help to clarify various test weight situations. Table 1 reviews the Canadian Grain Commission (CGC) standards for the various grades of corn based on the sample test weight. However, there may be other aspects of the sample that could influence grade such as damaged kernels and foreign material, among others. For the complete grading specifications see www.grainscanada.gc.ca. Some of the concerns about test weight this year are driven by the fact that corn is quite high in moisture and in many cases the corn did not mature completely before a killing frost. The general consensus is that corn with higher moisture at the time of testing will have a lower test weight than if it was tested at 15.5 percent. Researchers have described mathematical formulas for estimating the change in test weight as moisture changes. In some cases, this might represent an increase in test weight of two to five pounds per bushel. In many cases a lower test weight score on wet corn delivered to an elevator would not have an impact on what one gets paid. For example, if your corn tests 54 pounds per bushel (67.4 kilograms per hectoliter) wet, but it would have had a test weight of 57 pounds per bushel (71.0 kilograms per hectoliter) dry, your grade is not influenced and since you are getting paid on weight, nothing changes. In a year with immature, wet, low test weight corn, there is increased concern. Now the test weight on a wet sample may drop you to grade three, four, five or sample grade corn. This might result in possible discounts applied in the range of $1.50 to $70.00 per tonne. The additional snag in all of this occurs when you want to leave corn out in the field to dry in order to lower drying costs and increase test weights. Corn that is frozen before maturity tends to dry slower than grain that matured naturally. The best way to get moisture out of a kernel is to push starch in. Unfortunately once the corn is frozen there is no more capacity for starch to enter the kernel and moisture must migrate out through the kernel wall; this can be a slow process depending on weather (drying conditions), husk tightness and ear orientation. There are also some suspicions that these low density kernels may also re-wet given the right conditions. What is low test weight corn worth? From a feed perspective, researchers to date have concluded that bushel weight is generally not a reliable indicator of the feeding value of corn. Additionally, some have concluded that corn test weight does not significantly affect pig growth until it drops below 56 kilograms per hectoliter. They suggest that as test weight declines below 56 kilograms per hectoliter, digestible energy decreases by five to six percent and as a result, feed efficiency and growth rate also suffer (three to ten percent) because of reduced energy intake. In some isolated examples, corn with test weights as low as 50 kilograms per hectoliter could support similar animal performance compared to corn with normal test weights. If test weights drop you into sample grade corn what are your options? The Corn Salvage Benefit from Agricorp pays insured corn producers $0.49 per eligible bushel. The number of eligible bushels is either your harvested yield of sample grade corn, or the difference between your total guaranteed production and your harvested yield of grade one to five corn, whichever is less. Payments are made on eligible bushels, up to your total guaranteed production. So if your corn is sound in all other grading aspects but has a test weight less than 58 kilograms per hectoliter and is graded sample and you are experiencing significant discounting it may be better to use it or sell it directly for feed. You may also be able to claim the Salvage Benefit of $.49 per bushel. All licensed elevator operators and/or dealers abide by the Code of Practice for Trade in Corn and Canola in Ontario. The code outlines that all corn and canola must be inspected on the basis of the grades established under the Canada Grains Act. Elevator operators and/or dealers must have the necessary equipment, calibration charts and trained personnel to ensure the test results are consistent. Farmers have the right to be advised on the grade, dockage, condition and moisture assigned to the corn prior to unloading. If there is a dispute in respect of grade, dockage, condition or moisture of any load, it must be made at the time of delivery. 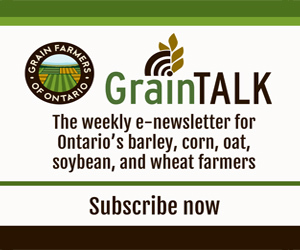 In the event of such dispute, samples will be forwarded to the Canadian Grain Commission for a final decision. Costs of forwarding samples will be shared equally between the farmer and the elevator. However, fees assessed by the CGC for testing and inspecting samples will be the responsibility of the party found to be in error.